For a few years, when I was very young, my family and I would visit my grandmother every Christmas. I don’t remember too much about those visits. But what’s always stuck in my mind, along with the ping pong set in her basement and the rounds of Pokeno we used to play, is her antique Christmas ornaments. They were beautiful – shiny, colorful glass in spheres and spires. And those memories have inspired me to recreate those shapes in paper. This week I’m sharing how to make antique-inspired quilling paper ornaments. When I began thinking about this tutorial, I quickly realized that the vintage glass ornaments that I was thinking of were just made of a few separate 3D shapes. And these shapes are easy enough to make with quilling paper! First, choose the colors for your ornaments. I went with pale ivory, silver, and pink. You will need quite a bit of whatever color you use. Note to other quillers: as you get closer to the holidays, it gets harder and harder to find white paper strips! They go fast so stock up early! This was the main reason I’m demoing these with Lake City Crafts’ Ivory paper. We’ll start with the rounded shape on top. Glue 6 strips, end to end, and roll into a tight coil. For reference, Lake City’s strips measure 24″ in length. If you’re using another brand of paper or cutting your own, the entire length of the strips should be around 144 inches. Since this dome is made from 2 pieces, you’ll need to roll a second tight coil of the same size. Form one coil into a shallow dome with your fingers. Shape the other into a deeper dome, using a quilling mold if you like. Apply some glue to the inside of each dome, brush to coat evenly, and let dry. The spire on the bottom of the ornament will also be made in two pieces. Roll another 3 strips into a tight coil. Dome and glue in the same way as the coils above. For the long cone, use a long slotted tool. The steps for the cone are the exact same as I used to make the hat on these quilled gnomes and these mushroom stems. The only difference is that you want to keep this cone straight, instead of giving it a bend. You will need 3 strips to make sure your cone will fit with the dome. Since this cone will be so large, it may be helpful to roll one strip on your tool, coat that shape with glue and let it dry. Then add the next section, glue and dry. And follow with the third strip of paper. I found it easier to control the shape of the cone that way. Once all your pieces are dry, apply a bit of glue around the edges and press together gently to seal. The rims should match up, but don’t worry about a bit of a gap here and there. You’ll cover the seam later on! Roll some more tight coils to connect the ball and the spire. Try to make them as centered as you can. Add all your pieces together and let them set. I found it easiest to dry them with the point up! When it was time to cover the seams of the two 3D shapes, I cut a strip of gold-edged paper in half lengthwise to make a skinny strip. If you roll this with the beehive technique, you’ll get a subtly shiny and frilly detail that will hide any gaps! 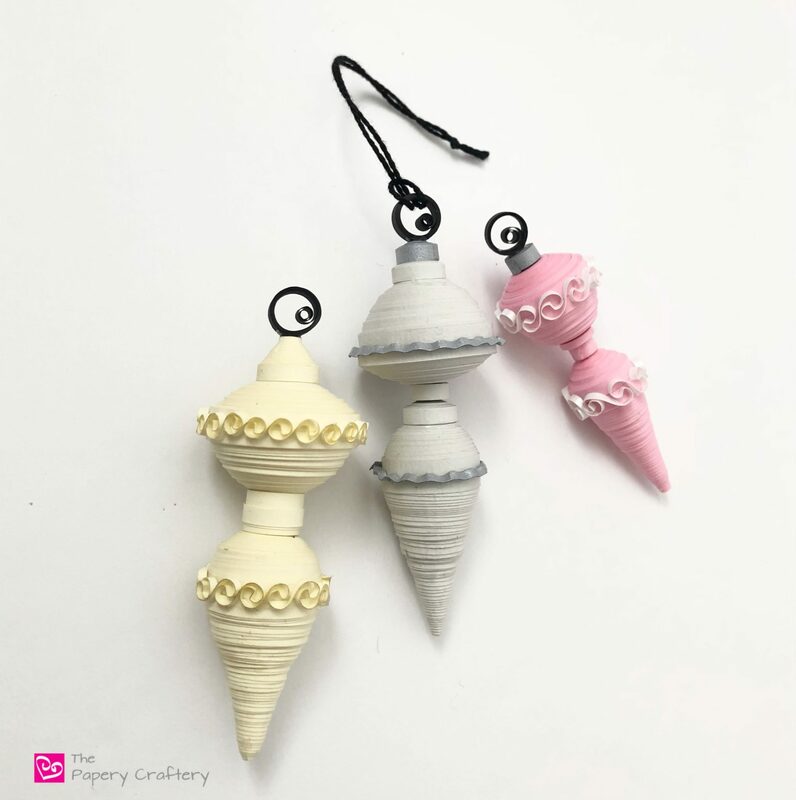 To complete the ornament, I added a small cone at the top and a black loop for hanging. I used my crimper to add a ruffled detail to my silver ornament. And this sweet pink and white ornament was just for fun! These antique-inspired quilling paper ornaments ended up about 4 inches long and look beautiful hanging from my tree! Once you’re comfortable with putting these together, you can experiment with your shapes and how you use them. The silver dome is flipped upside-down and I also played around with the size and width of my connecting coils. I’m pretty happy with how these ornaments turned out. They really remind me of my Grandma’s house! Just as an FYI, this will be my last post for the year. I’m taking the next few weeks off to enjoy my daughter’s birthday, Christmas and New Years. But I’ll be back in January after a bit of rest. In the meantime, I want to truly thank everyone who has taken the time recently to email me or comment on one of my tutorials. Your kind words of encouragement mean more to me than you would ever believe! Happy Holidays and I hope everyone has a wonderful New Year! What a wonderful treat. These ornaments are really beautiful. The added details of the gold, crimper and silver makes each one unique. Thank you. Enjoy your holiday as well. So glad I found your blog. So glad you’re here too, Barbara! These are awesome! I love all of your amazing quilling projects! Back in the 70’s, I worked at a large grain elevator. I was in charge of the tellex machine and was allowed to have all the ticker tape. I had no idea what quilling was, but I made Christmas bell ornaments pout of the tape….painting them and using glitter to decorate and personalize them. These are gorgeous! I’d been pondering on how to make 3D baubles for a while and had kind of come up with a similar plan to yours but seeing these inspired me to actually try it out, thank you 🙂 This last Christmas I made around 25 snowflakes and gifted most of them as greetings cards by attaching place name cards and makibg coordinating box envelopes……. first time in years that I’ve had time to sit and craft by virtue of being grounded due to ankle surgery but now I’ve got the bug again and these are going to be my new project……and icicles too! I really look forward to your posts. Hi Carol! I’m glad you’re crafting, but I’m sorry it’s due to ankle surgery! I hope you’re feeling better soon. If you have any questions, feel free to reach out!